Use this short list of ingredients to have a few easy, go-to dinners on hand at all times. You're going to pick up a lot of new tricks when the baby arrives; from diapering to stroller-folding to learning how to master everyday tasks as a one-handed, baby-balancing wonder. A great trick to pick up now? Have a few easy, delicious, healthy, go-to dinners down, preferably using staple ingredients you can keep on hand at all times. Trust us: 20 Minute Meals will be life savers both now and after the baby comes. This recipe for Lemon Grilled Shrimp with Orzo and Broccoli is the perfect example. It uses a short list of ingredients that I always keep on hand to use in all manner of easy meals. Bagged Frozen Shrimp: So easy to grab and cook by the handful—just defrost under cool running water in a colander for a few minutes in the sink. They cook in 2-3 minutes in a sauté or grill pan to add to pastas, stir fries, soups, fajitas, etc. And while you're in the freezer...A Variety of Frozen Veggies: Don't turn your nose up at these from childhood memories of mushy peas-n-carrots! Frozen veggies are as nutritious as fresh and can be just as delicious when cooked properly. I like to combine them with other cooked foods so their flavor and slightly softer texture blends in. Try broccoli with pasta or stir-fry dishes, corn in chilies and soups, sliced peppers in stir-fries and frittatas, cut green beans and peas in soups and stews. Keeping frozen veggies on hand makes it easier to eat healthfully even when you don't have time to shop or prep fresh every day. Quick Cooking Grains: The orzo in this recipe is nice and small to cook up quickly. Whole-wheat couscous or quinoa would also make fine substitutes, and they're great to use in a variety of warm and cool chopped salads. Crumbled and Hard Cheeses: I always keep a block of Parmesan and pecorino to shave on top of pastas, veggies and salads. (Hint: Use your peeler for pretty curls.) Crumbled goat cheese and feta are other great staples to enhance warm or chilled salads and pack a powerful punch. A little goes a long way with these, too—they give foods amazing flavor in a reasonable portion with less fat and calories. Just be sure to choose pasteurized while pregnant. Good Quality Olive Oil: Always. For drizzling over dishes, marinades, vinaigrettes, cooking, everything! Lemons and Limes: They keep a long time in the fridge and add a fresh jolt of flavor that compliments just about any sweet or savory dish. Try using the juice in sauces, vinaigrettes, dressings, drizzled over cooked meats or veggies. Hint: Don't overlook using the zest (finely grated). It adds a clean citrus flavor without extra tang or moisture. Lemons work with just about any cuisine but try lime in any dish that has an Asian, Latin or Mexican feel. Versatile Spice Mixes: Why dig around and measure from two or three little bottles when you can just grab one? Some of my perennial favorites: Garlic salt to season grilled foods, dips or pizzas; Pumpkin Pie Spice in oatmeal, yogurt and fruit desserts; Italian Seasoning in sauces, veggies or another 20 Minute Meal—my Baked Turkey Meatballs. Herb Garden: If you can, it's a great idea to keep an herb garden with staples to snip as you need them in your cooking. (Parsley, mint, basil and dill would be my top picks). A sunny window can do the trick in even the tiniest of apartments! Planting a few pots can be a gratifying "nesting" project that you'll continue to reap the benefits of. The flavor of fresh just can't be beat and they'll pretty up your space, too. Shallots or Scallions: Another great flavor booster to keep on hand. Scallions lend a mild herbal onion flavor to just about anything and keep for over a week wrapped in a damp paper towel in the crisper. Shallots are smaller and milder than onions with a flavor blend of onion and garlic. They keep for weeks at room temperature and are small enough to use up in one dish. With a little advance pantry and fridge planning plus this easy list of "Always on Hand" ingredients you'll be able to whip up a variety of 20 Minute Meals now and after baby arrives! 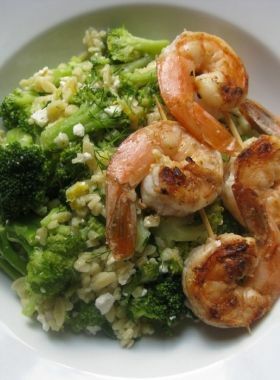 Try my recipe for Lemon Grilled Shrimp with Orzo and Broccoli to get started.